October 10 – Lt. Gov. 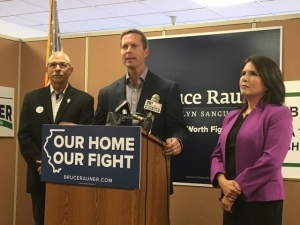 Evelyn Sanguinetti and U.S. Rep. Rodney Davis took turns criticizing Democratic gubernatorial candidate J.B. Pritzker during a joint appearance Wednesday in Decatur. 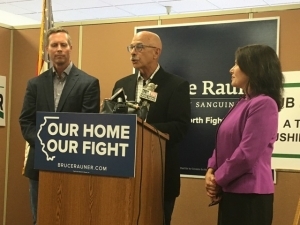 During a news conference at the Macon County GOP Headquarters, Sanguinetti and Davis pointed to Cook County Inspector General’s recent “scheme to defraud” finding against Pritzker related to the removal of toilets from a $6.5 million Chicago mansion. 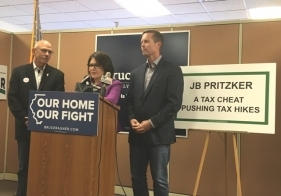 Sanguinetti said the report shows Pritzker is a “fraud, lacking the character and lacking the integrity that we need in a leader to lead the state of Illinois” and urged voters to support Gov. Bruce Rauner. Davis, who is running for re-election in the 13th Congressional District against Betsy Dirksen Londrigan, joined his fellow Republican representatives last week in calling for a federal investigation into Pritzker’s actions. He said this is not about partisan politics or campaigning. “Let this sink in: The Cook County Inspector General accused the Democrat gubernatorial candidate in the state of Illinois of committing a scheme to defraud the taxpayers of the same state that he wishes to represent. This is not a partisan hit job; this is the truth,” he said. “Really this does not have to do with Republicans and Democrats. It has to do with fundamental fairness and calling out politicians who are in it for the wrong, corrupt reasons,” said Sanguinetti. According to the report, Pritzker saved $330,000 in property taxes by having the value of the mansion reduced. He has agreed to repay those tax dollars, a move Sanguinetti said proves his culpability. Dan Caulkins, candidate in the 101st State Representative District, appeared alongside Sanguinetti and Davis. Davis said figures show that the savings seen by the billionaire Pritzker were minuscule by comparison to his wealth but deprived the state valuable resources. Sanguinetti and Davis both admitted that Rauner has had his share of missteps in his first term but remains the better option for taking the state in the right direction.